Saturday last, one decided to stay in Astoria rather than trek over to Newtown Creek in pursuit of some photos. Funnily enough, HQ is roughly equidistant between the southern border of Western Queens – Newtown Creek – and the Northern – Bowery Bay. Luyster, or Steinway, Creek is accessible from the street in only one spot that I’ve ever been able to find. It’s a tributary, essentially, of Bowery Bay. Bowery Bay is a section of the water heading eastwards of the East River which splashes up against Astoria’s northern coastline, and which moistens Rikers Island and LaGuardia Airport. Eventually, you hit an invisible line analogous to East Elmhurst and then you’re in Flushing Bay. 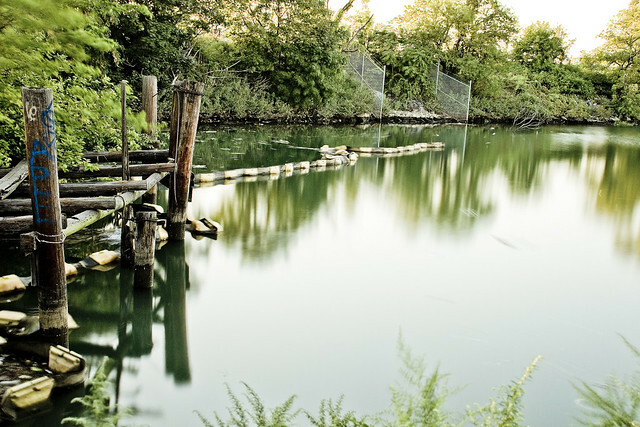 Like Newtown Creek, Luyster Creek is highly contaminated by a variety of “point sources” revolving around industry and municipal sewer outfalls. 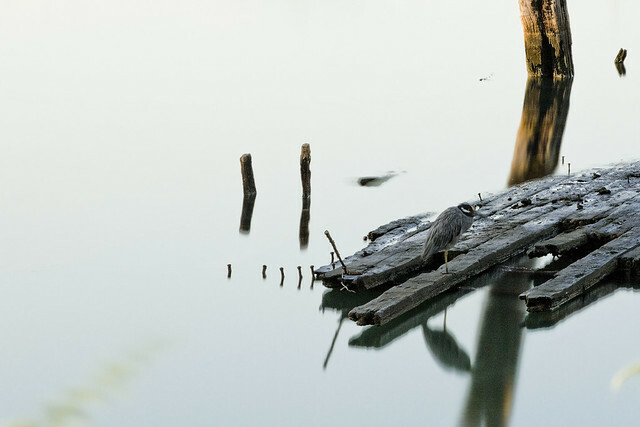 Unlike Newtown Creek – Luyster Creek doesn’t have any community groups of concerned citizens, or alliances devoted to “reveal, restore, revitalize” looking after it. Oddly enough, Luyster Creek also sits square in the district of the Chair of the City Council’s environmental committee who has never mentioned it, but there you are. I like to come by here about once or twice a year to check up on things. The illegal dumping along its shoreline is generally of the light industrial type – last Saturday there were a few dozen rolls of roofing tar paper, rotting insulation panels, and somebody had decided to drop off a bunch of building scaffold sections along the shore as well. Access is limited to the waterway, and these shots were accomplished while standing on top of a combined sewer outfall. There were quite a few critters doing their thing down at Luyster Creek just before sunset, birds and such. The water was also positively boiling with icthyan activity. That floatables boom you see in the shot above is because of me, since the last time I was down here there was a stream of oil pouring into the water from a privately owned sewer hidden behind those piles and I made a call to one of my Newtown Creek contacts who works for a state agency that polices such matters. The garbage piled up behind it will presumptively be collected by a skimmer boat at some point. It just pisses one off that such citizen action is required in Astoria, where, as mentioned, the City Councilman directly responsible for overseeing environmental matters is based. Additionally, the City Department of Environmental Protection – or DEP – has its Bowery Bay Wastewater Treatment Plant based just a few blocks away. 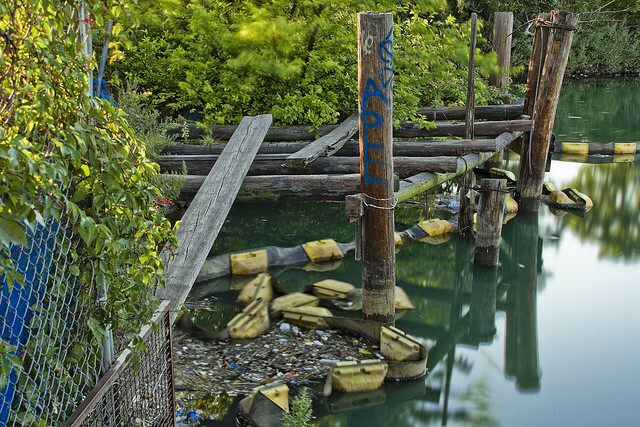 You’d think… Well… lessons learned on Newtown Creek, and the world only makes sense when you force it to do so. I guess this means I’m going to have to start thinking a lot more about Luyster Creek in the coming years.